This Flip Side is cheating a bit (as no one should be surprised that Henderson was an All-American athlete at any sport in high school) because there isn’t much strange on the back of the card. I’ll admit that upfront. I will also admit that I was tricked by the back of the card…which was why it was first selected. 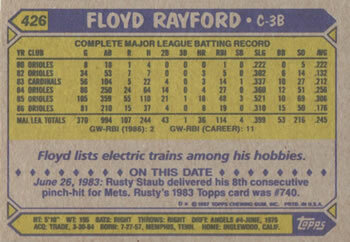 If you look quickly, it looks like Henderson hit only one HR in the 1986 season. Of course he hit 14 for Seattle that season, and the year before and the year before that. What would be so odd is that, somehow, Henderson only hit one round tripper in the regular season but would step to the plate in the American League Championship Series with the Red Sox one out away from elimination and stroke a 2-2 pitch from Donnie Moore over the fence to give the Red Sox the lead. The Sox went on to win that game and the next two to take the series 4-3 and then on to the World Series and the ball that went through Buckner’s leg. If Henderson did not hit that HR, he could have been Buckner. People forget that earlier in game five, Henderson did his best prescient Jose Canseco impression by bouncing a Bobby Grich fly ball off his glove and over the fence. 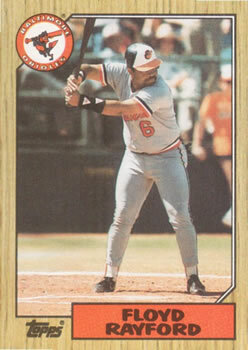 He also batted just .196 in the 36 games he played for the Sox in 1986. He wouldn’t fair much better the following year. The Sox traded him after he went .234/.313/.418 over 75 games. The player to be named they got was named Randy Kutcher. He, along with Curt Schilling, is one of two players born in Alaska to have played for the Sox (h/t to Sons of Sam Horn).